Between three to five hundred people, from thirty to forty countries, participate in these six to ten day gatherings. These days include theoretical and experiential training in large group settings, where a variety of issues relevant to the group and the world are processed. Due to the enormous social differences in our world today, participants should expect the expression of passionate emotions that often emerge in group life. Varied styles of communication are encouraged to support the expression of diverse cultural and ethnic groups. In the spirit of deep democracy and love, we aspire to creating a community where all voices are heard and friendship is cultivated. Small groups meet daily to practice specific training exercises and process group issues in a more intimate environment. Relationship work and inner work are integral aspects of worldwork methodology. Participants may attend one-to-one personal development sessions to focus on individual issues that might arise. Sessions are included in the price of tuition. Special interest groups have an opportunity for coalition building and networking. Social awareness and educational groups are also a cohesive part of the program. 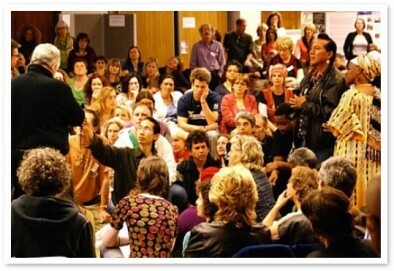 Each Worldwork seminar is unique based on the hosting location, individuals, local and global political climate, and the spirit that moves us when we gather. The focus is on issues that emerge within the host country and issues and experiences within the international community. The Worldwork seminar is facilitated by an international team of facilitators trained in process-oriented facilitation, including the founders Arnold and Amy Mindell. Additionally, we recognize that leadership emerges organically out of group process and believe that everyone is a potential facilitator. The Worldwork facilitation team facilitates a diversity of learning experiences that include large group focus and interaction, small group meetings, and one-to-one personal development sessions. Social awareness, educational and networking groups are also a cohesive part of the program. When we face conflicts within or between communities, organizations, groups and nations, or when we witness violence, prejudice or human rights violations, it’s natural to feel overwhelmed by the problems we hope to solve. Worldwork as a methodology supports us to recognize how we contribute to the escalation of conflict, and how we can contribute to conflict resolution and make a difference in our communities. When communication breaks down or reaches an impasse, Worldwork methods support the interaction to deepen and go forward. Learning together in an international forum brings us face to face with a variety of belief systems, cultures and histories, and inspires us to step into our eldership, explore differences and attempt to co-create the world we dream of. People who attend a Worldwork seminar usually have a personal and professional commitment to making a difference in their communities, and are seeking to develop their skills and experience in working in situations of tension and conflict. Participants of past Worldwork seminars have been involved in the fields of human rights, conflict resolution, mediation, multi-cultural communication, education, psychology, social work, organizational development, journalism, peace building, social action, social theater, and more. Worldwork is for people who want to listen, reflect, and engage around pressing social issues, while also learning the theory and skills of facilitation. To see videos created from the large group processes in Worldwork 1999 in Washington DC, see the Video Worldwork Series: Videos 1-6 (links to the videos are listed under “Group Processes in Worldwork Seminars” here). Learn methods to support diversity and multi-cultural communication, which include recognizing dynamics of privilege and prejudice. Learn and practice methods of conflict facilitation including mapping polarizations and roles, and noticing and facilitating at hot spots. Recognize dynamics of oppression, accountability, and revenge. Learn about the principle and practice of ‘deep democracy’, recognizing that communities find resolution and a way forward when there is an interaction of all points of view and dimensions of experience. Learn inner work skills to stay present as a facilitator, without being caught in a polarized position, in the midst of tension and emotionality. Learn about the connection of one’s personal history and collective issues and conflicts, exploring how one takes part in the perpetuation of conflict, and/ or its resolution. Develop leadership skills based on awareness and facilitation rather than dominance. Learn and practice team building skills and the confidence needed for negotiation and partnership, particularly in multi-cultural situations. The next Worldwork seminar will be held in Greece from April 23-28, 2017.